Images from the Navy Art Collection will soon be on the set of the hit TV show, NCIS, starring Mark Harmon. 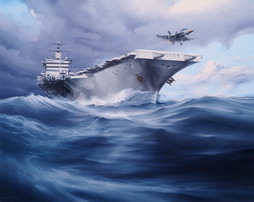 The reproductions are the works of Navy Artist Morgan Ian Wilbur. In addition to “Steam for Speed“ (shown here), “USS Cornado Rides A Sparkling Sea”, “Naval Air Over Korea” and “Turnin’ & Burnin’” were also selected. The episode will be taped from March 7th through March 18th. Watch for them in the upcoming season. View over 6000 images from the collection at RequestAPrint. "RequestAPrint is easy to work with for custom and regular orders. It feels like a partnership that allows me to create new ideas and helps implement them for our shop. They're always accessible." - Michelle G.